Gaya Island Resort will certainly take your breath away. Perched on a luscious island set within the beautiful Tunku Abdul Rahman Marine Park, this divine resort is nestled amongst thick mangrove forests, with gorgeous villas tucked away in the hillside, whilst the main facilities and restaurants rest closer to the pristine shores of Maloham Bay. 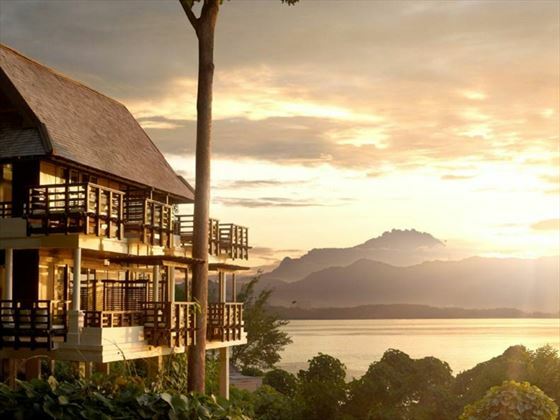 The stilted villas blend perfectly with their wonderful natural surroundings, overlooking either the mangrove forests and the thick canopies, or stunning Mount Kinabalu. 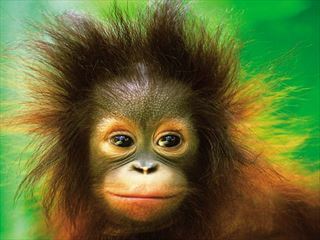 The décor is modern, yet adopts a Borneo style, and all have plenty of room for you to relax and rejuvenate. 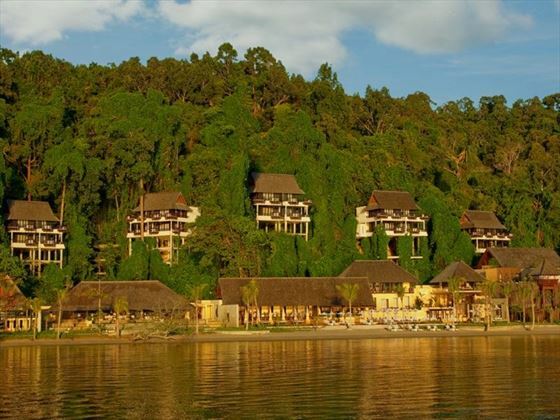 Gaya Island Resort is traditional luxury at its finest, and the resort prides itself on its environmental awareness, including raising awareness and protecting the local wildlife, as well as building with local materials and offering a true Borneo experience. The restaurants here use only the freshest, local cuisine. Tuck into sustainably caught seafood at Fisherman’s Cove, or try an incredible fine dining experience at the Japanese restaurant, Omakese. You could even indulge in a wonderful private dining experience – including dining with your feet in the sand, or enjoy a delicious lunch on Tavajun Bay. The Spa Village adopts ancient traditions in order to give you an authentic Borneo spa experience. Rice scrubs and Balinese massages will leave you feeling completely refreshed. 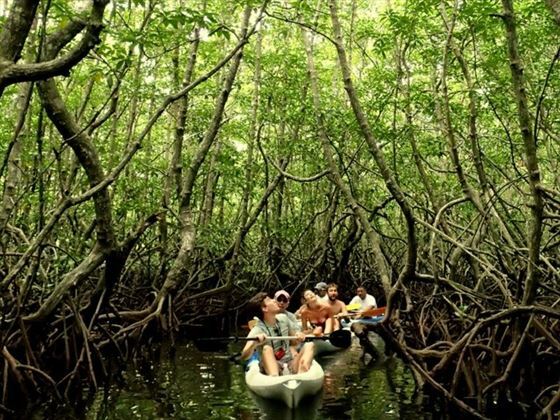 There are many amazing experiences to try too, including the ‘7 Wonders of Gaya’ programme, in which you explore the area with the Resident Naturalist in search of proboscis monkeys and giant flying red squirrels, or the Marine Centre, where you’ll learn about the island’s conservation efforts. End the day with a Singgah Singgarung Night, where you’ll be given an insight into Borneo’s native arts and activities, alongside tucking into a tribal-style beach BBQ. 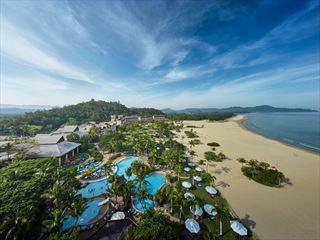 This spectacular resort is nestled on a breath-taking island, set within the protected Tunku Abdul Rahman Marine Park. Vibrant, verdant rainforest sweeps across the island, framed by sugary sand beaches and unbelievably clear waters. 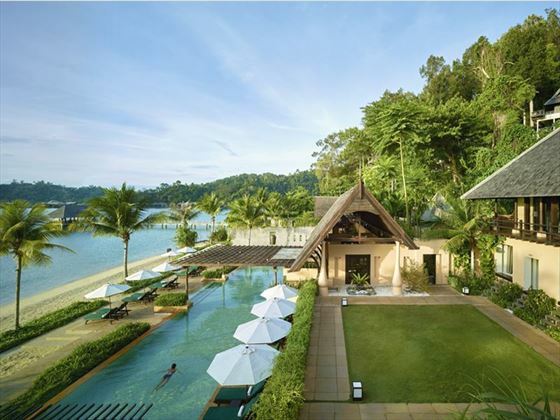 You’ll find Gaya Island Resort hidden amidst protected mangroves, offering amazing views of Mount Kinabalu and Maloham Bay – the pristine coastline just steps away from its doors. The resort is reached by a 10 minute speedboat journey from Jesselton Point in Kota Kinabalu; the resort has its own lounge at the port and check in to the resort is conducted at Gaya Lounge before you are escorted to the jetty for the speedboat transfer. At Gaya Lounge, a welcome treat and mineral water will be provided during check-in, while coffee and tea are available upon request. Wireless internet access is also provided in the lounge. If you are arriving into Kota Kinabalu airport, a private driver will meet you for a seamless transfer to the lounge and onwards to the island. 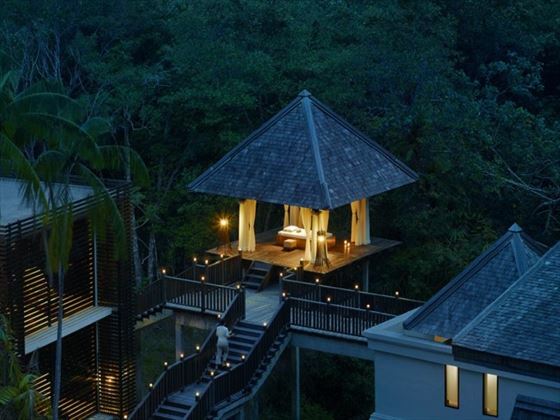 Bayu Villa – Truly peaceful villas hidden amongst the luscious rainforest, with gorgeous mangrove and canopy views. Connecting rooms are available. Canopy Villa – Nestled on a gently sloping hillside shrouded by mangroves, these elegant villas are walking distance to the resort’s sugary sand beach, whilst some are closer to the resort’s main facilities. 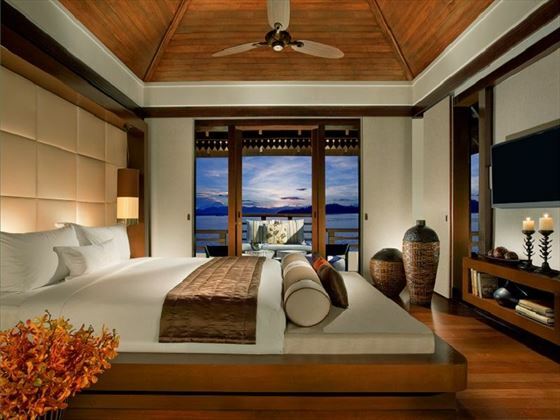 Kinabalu Villa – These scenic villas offer incredible views spanning across the South China Sea. On a clear day, you may even see the outline of Mountain Kinabalu. Connecting rooms are available. Suria Suite – A luxurious two-bedroom suite situated on the lush hillside and overlooking the soothing ocean. On the ground floor, you’ll find a relaxing lounge and dining areas, plus a pantry that leads on to the beautiful outdoor deck. Upstairs, the two bedrooms both come with an ensuite bathroom and an outdoor bath on the balcony that looks out on to spectacular views. Feast Village – A bright and inviting restaurant serving up an eclectic menu of cuisine from the Asia-Pacific region, and partnered with a view of Mount Kinabalu. This is a fantastic interactive dining experience, thanks to the open kitchens showcasing a variety of foods. Open 7am-10.30am, 12pm-3pm, and 7pm-10.30pm. 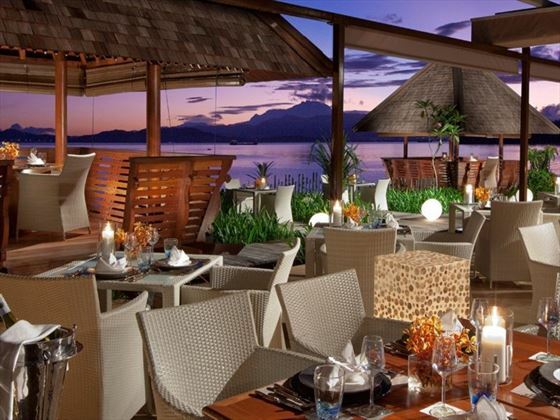 Fisherman’s Cove – Nestled on the rooftop, this open-air restaurant offers unsurpassable views of Mount Kinabalu, and serves a unique menu of delicious seafood dishes created by Chef Wai, the pioneer of this renowned restaurant. Focusing on sustainable fishing practices, these dishes here are unbelievably fresh. Children aged 12 and over are welcome. Smart dress code. Open 7pm-10.30pm. Omakase – You’ll find this beautiful two-storey Japanese restaurant hidden amongst the rainforest-shrouded hillside, offering a stunning view of Malohom Bay and Mount Kinabalu. The restaurant specialises in three omakase-style dining experiences (where dishes are selected for you by the chef), and includes teppanyaki, shabu-shabu and nabe. Open 7pm-10.30pm. Pool Bar & Lounge – Perched just above the infinity pool and floating cabanas, this delightful al fresco bar is a great place to tuck into a light lunch in between sunbathing. As the day draws to a close, venture here for sundowners and light bites whilst you watch the sun go down. Open 10am-11pm. Tavajun Bay – The lovely private beach is just a five-minute boat ride from the resort, and once here, you’ll be treated to a single-dish lunch inspired by local and international cuisines, cooked over charcoal embers. The dish changes daily. Alternatively, you could pre-order a personalised gourmet picnic basket to enjoy on the sand. Open 12pm-5pm. 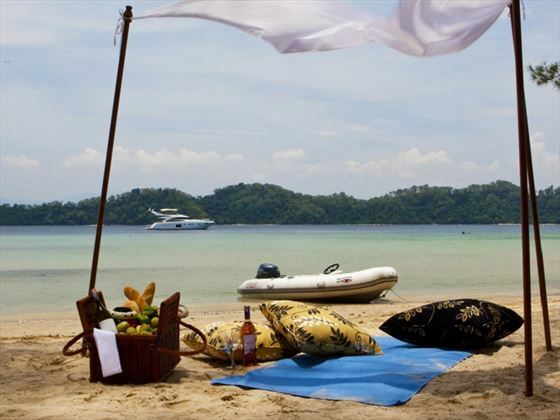 Private Dining – Whether you fancy dining on a table submerged in the shallow waters, enjoying a sunrise breakfast on the beach, setting up your own Bajau Laut Beach Barbeque, or picking a spot on the beach with a personalised gourmet picnic, Gaya Island Resort has a plethora of memorable private dining experiences. Coral Garden Marine Expedition – Discover the incredible marine life living in the azure reefs with the Resident Marine Biologist. Spa Village – A hidden paradise nestled within luscious mangrove forest, this beautiful award-winning spa blends ancient healing practices and natural, local ingredients with modern approaches to wellness to create a completely one-of-a-kind spa experience. This is the place to restore your mind, body and soul, indulging in ancient traditions including those of the Bajau sea nomads, as well as rice scrubs, avocado and coconut hair masks, and indigenous massages. 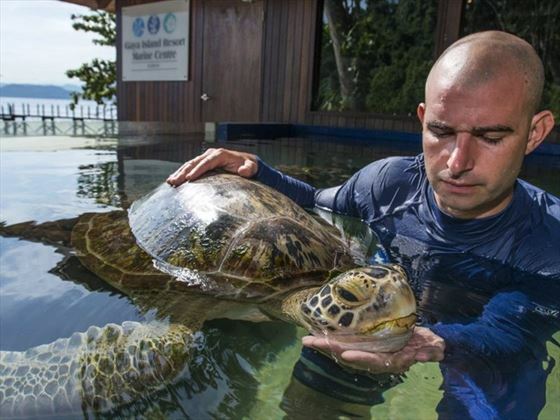 A compulsory conservation fee of approximately £4.50 for every night of stay is applied to each guest, including children, by Sabah Parks and the Tunku Abdul Rahman Marine Park conservation. 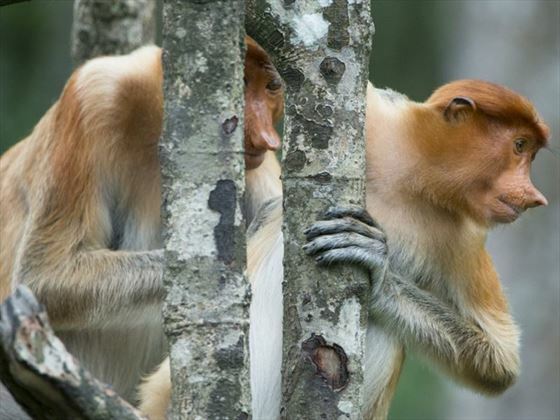 This conservation fee supports the effort towards preserving the rich ecosystem of the region. The fee is added to your final bill and will be payable on check-out from the hotel. Free room upgrade Complimentary room upgrade from a Bayu Villa to Canopy Villa or a Canopy Villa to Kinabalu Villa when you stay for 5 consecutive nights or more. Book by 8 May 19. Valid for travel between 15 Apr – 31 Jul 19, 1 Sep – 19 Dec 19, 7 Jan – 23 Jan 20 and 3 Feb – 31 Mar 20. Combinable with other offers. Great savings Book for a minimum of 5 nights and enjoy a 25% discount; stay for 3 nights or more and save 15%. Offer is not valid for travel 20 Dec 19 - 5 Jan 20 and 24 Jan - 2 Feb 20. Prices shown reflect offer. 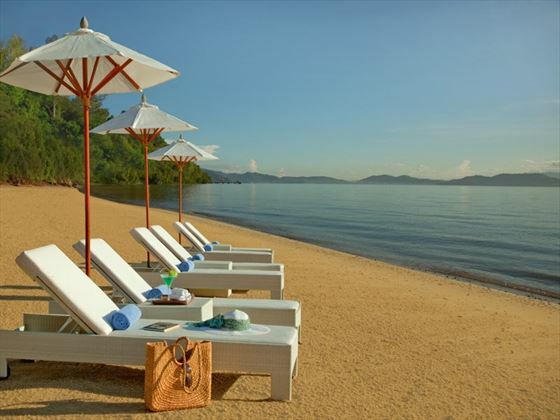 Shangri-La’s Rasa Ria Resort & Spa is arguably Kota Kinabalu’s premier beach resort. 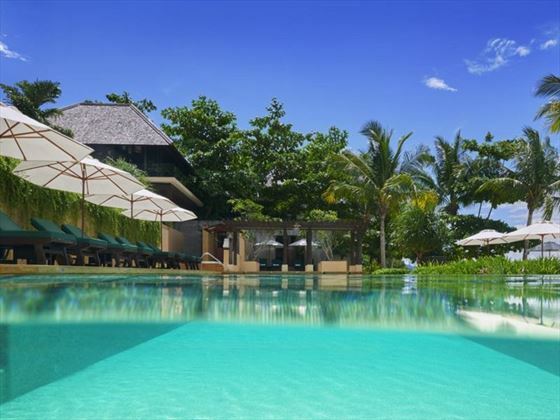 Set on Pantai Dalit Beach, this stunning resort is nestled within over 400 acres of lush tropical vegetation and includes an awe-inspiring nature reserve. 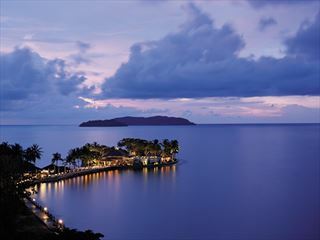 With a private beach, views of the sparkling coral islands, and legendary attentive service, Shangri-La’s Tanjung Aru Resort and Spa offers the serenity of a secluded tropical Kota Kinabalu luxury resort just 10 minutes away from the centre of downtown Kota Kinabalu.